The House That Jill Built lets youngsters design, build, and animate a variety of houses. Developed by Joyce Hakansson Associates for CBS Software. Construction sets, interactivity, networking—these are some of the trends in the quickly evolving educational software market. A swarm of new companies have entered the competition, and a variety of different educational approaches are being tried. Few subjects will generate arguments faster in the microcomputer industry than what makes good educational software. Interest in computer-based learning programs has never been greater, nor the debate over future directions more vocal. Parents and teachers are requesting more and better packages. Computer companies are courting software firms that specialize in educational products. And greater numbers of educators are getting involved in the production and distribution of these programs. Increased competition in this growing field is creating several important trends that will directly affect both the quality and the kind of future computer learning programs. Even staunch supporters admit that educational computer programs generally have a long way to go to reach their potential, but the software is evolving rapidly. There's now "some clarity about what educational software is," says Marilyn Rosenblum, vice president of product development for CBS Software, a company that produces several lines of educational programs with such developers as Joyce Hakansson Associates and the CTW Software Group from Children's Television Workshop. "I also think the technology is being challenged much more than it was a year ago. Things that would have been acceptable then are no longer acceptable," she says. "We're getting away from a lot of drill and practice," adds Marge Kosel, director of microcomputer courseware for Sunburst Communications, a company that produces educational software. "Designwise, drill and practice is the easiest [to produce]. Now, there are a lot more simulations and problem-solving. The technical quality of software has really improved." Greater emphasis is being placed on the amount of interaction that occurs between the student and the computer in several of the newer educational packages. And a higher level of sophistication has been built into other programs, as some software developers reach for an older, teen-oriented educational market. Take, for example, The Learning Company's new Robot Odyssey I (Apple II family, $49.95). Inspired by the company's earlier, Rocky's Boots, the new package is both a game and an educational tool. It's one of a growing number of products called construction sets, or builders—a programming style made popular by Bill Budge's Pinball Construction Set. Programs written in this style are highly interactive and allow the player to control many aspects of the game environment. 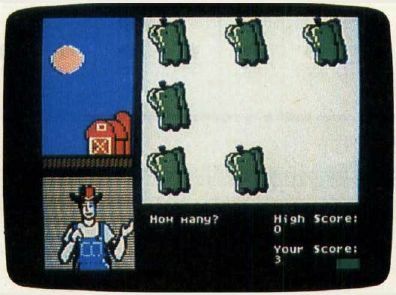 In Robot Odyssey I, for instance, the player actually designs robots and builds computer chips, which are later used to help the player escape from a futuristic robot-run city, Robotropolis. The program features built-in tutorials to teach the basics of digital logic and an Innovation Lab in which players design and test chips and robots. In Robot Odyssey I, players must build robots to escape from Robotropolis, a futuristic underground city inhabited by robots. Marketed by The Learning Company, Robot Odyssey I is the first program in their new DigiWorld series, which is aimed at the teenage market. New programs from Atari, Inc., also reflect the trend toward greater sophistication. The company's Milestone Series from Atari Learning Systems and its Futuremakers simulation programs are quite interactive and feature a hands-on approach to learning. The AtariLab science packages, part of the Milestone Series, let youngsters simulate more than 100 different experiments using the computer and a laboratory kit. 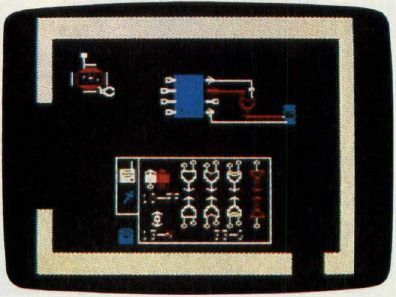 The freedom to move almost anywhere within an educational program is an important aspect of the Arrakis Advantage, a family of educational software marketed by Prentice-Hall for Apple, Atari, Commodore, and IBM PC and PCjr computers. Directed at students in grades 7 through 12, the Arrakis Advantage series is based on the Socrates Learning Environment—a dialectical teaching technique borrowed from the Greek philosopher, notes Charles de Martigny, managing director of Arrakis Systems. "Where other programs operate in only one direction, Socrates [the system] can move in any direction the user wishes," he says. "Students can interrupt, ask questions, test themselves, review and explore other subjects and, in effect, talk directly to Socrates as naturally as they would converse with a teacher." Students need that kind of flexibility since learning is not strictly linear, with one event following another in a predictable chain. Instead, information arrives in a parallel fashion, with information coming from a variety of complementary sources, points out Emiliano De Laurentiis, director of advanced research and development for Arrakis. "People should start looking for software that's more intelligent; software that allows you to interact on a normal level, to type in a sentence, to ask questions," he says. "The technology exists now. There's no reason why it shouldn't be implemented." The Arrakis Advantage series, available this fall, will initially include home programs that complement school curricula in algebra, geometry, biology, chemistry, physics, and statistics. Another proponent of the construction set approach is Joyce Hakansson, whose independent software development firm has already produced 19 "playful educational" packages for CBS Software, Simon & Schuster, Spinnaker Software, and Milton Bradley. "We like to build exploratory worlds for children to investigate—worlds full of sparkling graphics and music and a good measure of giggles," she says. "I want every aspect of a program, even the most subtle, to serve an educational purpose. If a child builds words, then building words should be a powerful tool to make something happen so that the reward is inherent in the activity. We feel a program should validate and support a child's natural intuition and enthusiasm for discovery." Among the newer programs developed by Joyce Hakansson Associates is The House That Jill Built (CBS Software), available now on disk for the Commodore 64 and this fall for the Apple II family. Created for children five years of age and older, the program lets the player design and build a house from the ground up. Youngsters furnish, decorate, and animate the environments simply and easily, but the program also can be used by older children and even adults in more complex ways. Working from electronic blueprints, you choose one of a variety of four-story houses to build. Doors, windows, and stairways must be placed throughout the house. Exterior styles must be selected (Victorian, modern, or colonial). And once the outside of the house is complete, you then design, decorate, and furnish the interior. Tips on design and notes on architecture are included in the manual. As the installed base of computers has increased, some software producers who previously concentrated their attentions on a school-based market are coming into the home with programs to supplement their curricular packages. Youngsters count as many crops as they can before the sun sets in DLM's Number Farm. DLM Teaching Resources of Allen, Texas, currently offers hundreds of educational materials for schools. DLM has made the transition into the home software market as well with its Arcademic Skill Builders series in math, language arts, and other areas. Educational software companies with strength both in the school and in the home will have the best chance of survival, says DLM's Karen McGraw, project editor for microcomputer software and a former teacher. DLM emphasizes content in its packages, she adds, but with a presentation that is also fun for the user and with programs that fully use the capabilities of the computer. "But we don't want a product just because it is an innovative use of technology, if it's not married to educational validity. We don't build software and then make it fit the child." In one of DLM's preschool educational games, for example, a timer is included to let the child know how much time is left in the program. 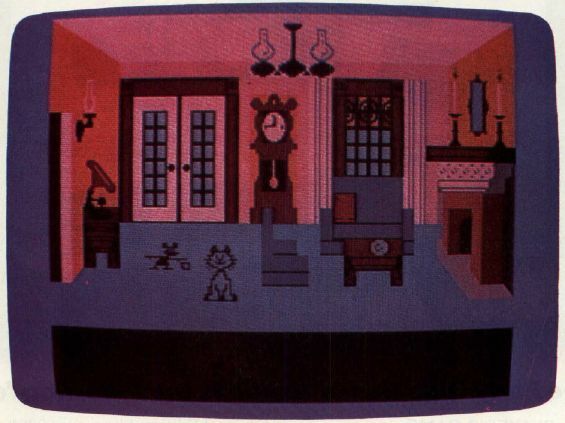 Rather than using a clock, which might have no relevance to a four-year-old who can't yet tell time, the program employs a day-to-night cycle to accomplish the same thing. At the start of the game, the sun comes up. As the game progresses, the sun crosses the sky and then starts to come down as the game draws to a close. When the sun sets and night comes onto the screen, the game is over. "We use real-world things that are important to a child, that a child can understand," says McGraw. "Unless you really know about education, unless you really understand the mind of a child, you would never think of it." Drawing on its experiences as a curriculum-based, educational-software producer, American Educational Computer (AEC) is also among those school-oriented software companies which have entered the home market. An educational program in the home can be much more effective if it's first been shown to be successful in the schools, argues AEC president, Thomas B. Garsh. "It's been tested and tried and is based on sound educational pedagogy," he says. "We know that if a parent buys it for a fifth-grade student and he or she gets better grades, then the parent comes back, says it worked, and buys it for the sixth-grade child." The movement of software from the school to the home is accelerating. Control Data Corporation, developers of the widely used Plato system of educational software, now has more than 12,000 hours of courses that include everything from instruction in basic skills and computer literacy to educational games and advanced calculus. And the company is in the process of converting many of its packages for use on personal computers like the Apple II family, Atari, IBM, and Texas Instruments. A related trend over the last year or so is the entry of large corporations, especially established educational publishers, into the home software field. Companies like Random House, Prentice-Hall (Arrakis Systems), SFN Companies (Mindscape), Xerox (Weekly Reader Software), Scholastic, Simon & Schuster, and Fisher-Price are bringing their talent, marketing muscle, and reputations into the computer learning field. "And that's very good," says Fritz Luecke, manager of computer software for Weekly Reader Software. "Most of them bring something to the business that other traditional software companies might not bring, and that is a different kind of marketing expertise. "They also bring, in many cases, a new way of packaging, a new way of adding things to a program to make it a total program, which is what we feel we have done with our products," he adds. Giving children items with which they are familiar—books, stickers, posters—in addition to the software package makes it easier for the youngsters to relate to the product, Luecke says. While numerous educational software companies are expanding their operations from school orientation to include the home market, the growth is very much a two-way street. Other companies, which have previously sold software strictly to the home, are approaching schools with their products. And the success which some microcomputer hardware manufacturers—especially Apple Computer—have had in donating products to school systems, is now spurring more software companies to try similar tactics. Using the slogan, "Be a hero, software your school," Scarborough Systems of Tarrytown, New York, is embarking on a major school-donation project this fall. Those who purchase Scarborough educational programs between September 15 and December 15 will find a coupon in each package enabling them to donate a piece of educational software to the school and teacher of their choice. The donated program does not have to be the same one purchased. The purchaser sends the coupon and $3.50 for postage and handling to Scarborough. The company will then donate the software to the school. A gift card telling the name of the donor and the name of the dealer where the software was purchased will be included in the donation. "We think it's a unique program, and it may provide up to $4 million in the value of computer software—that's 125,000 programs," says Sanford K. Bain, vice president of marketing for Scarborough Systems. The company has computer software for four machines—the Apple II family, Commodore 64, IBM PC/XT/jr, and the Atari family. "Obviously, we're doing it because we think it reflects a favorable image for the company," Bain says. "We strongly believe the validity for these programs has to come from the schools. And our donation program allows schools to sample software without great expense on their part." One school-based trend that disturbs DLM President Andrew W. Bingham is the tendency for schools to network their computers, which Bingham says can work against innovative use of the computers. "It almost scares me, because I think the evolution may ultimately lead us to miss the revolutionary potential of software," he says. "When there are just two or three computers in a school, teachers will use them flexibly and individually. "When the school gets more computers, they bring them all together into one room, because it's easier to control, easier to administer. Then they want a networking system," says Bingham. "What you get is students being marched to the computer for their 20 minutes of instruction and marched back to their seats." Bingham urges parents and teachers to explore innovative uses of the computer rather than trying to emphasize convenience of management. No matter what the area of computer-based educational programs, software companies and educators all agree that the field is still in its infancy in many ways. And expectations for the future are bright. "I think we're going to see an explosion in the next couple of years," says Sam Barkliss, chairman of Computerose, Inc., an educational software company. "I think we're going to see some astonishing things."